Sparrowling Press: MARGARET, THE NOT-SO-WILY FOX. 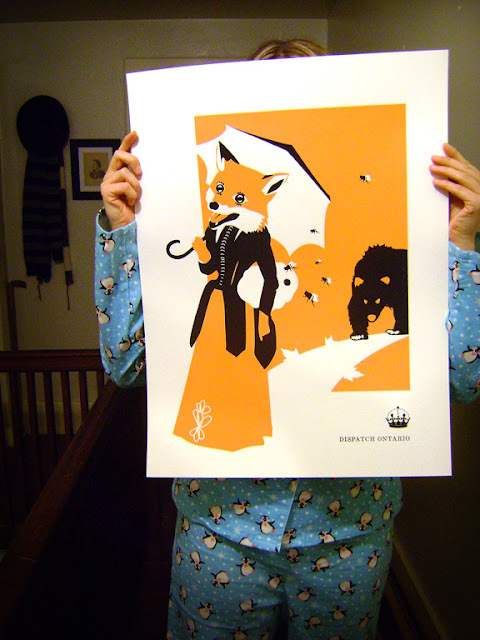 Screen printed on 24lb Bond stock by the good folk at Kid Icarus, this 18" x 24" poster introduces you to Margaret: the not-so-wily fox from our Dispatch Ontario children's book series. Inspired by Victorian and Edwardian illustrations, Dispatch Ontario's characters are best described as the anthropomorphic offspring of Edward Gorey and Beatrix Potter, with liberal dashes of Canadiana thrown in for good measure. With nods to turn-of-last-century children's books and New Dominion monthlies, Dispatch Ontario caters to the younger crowd, while still giving adults something to giggle about. Posters are shipped rolled into cardboard mailing tubes. Currently we only ship within Canada and the United States.